Founded in 1870 as the Arizona Citizen, the daily has gone through a painful downsizing process, culminating in a bizarre series of late rescue attempts. Owner Gannett Co. announced in January that it was putting the Citizen up for sale and would shut down the paper in March if no buyer was found. In February, the Justice Department said it was investigating the Gannett sale due to allegations that the company would not give up its interest in a joint operating agreement (JOA) it has with Lee Enterprises, publisher of the Arizona Daily Star. JOAs are legally sanctioned duopolies that enable partners to share profits and back office operations while maintaining competing editorial voices. Without the JOA, the Citizen is effectively a money pit. On March 16, just five days before the scheduled shutdown,we posted our first RIP for the newspaper, but the next day Gannett announced that two “very interested buyers” had emerged. In fact, the Citizen had at least five suitors during its final months, but none wanted to pay Gannett’s price. Meanwhile, the Justice Department confirmed today that it has closed its investigation into the sale and will let the Citizen shut down. The howls of protest are from Stephen Hadland, CEO of Santa Monica Media Corp., who says he still wants to buy the Citizen and who claims Gannett refuses to budge on price. The Citizen reported in March that Santa Monica Media is a “blank check company” that exists solely to perform mergers and acquisitions. Hadland has asked the Arizona attorney general for a temporary restraining to prevent Gannett from closing the Citizen. With no further interference from the Justice Department, however, it appears that the closure is a done deal. In a final strange twist, a Gannett implied that the stub of a website being kept in operation may be nothing more than a sop to the Justice Department to let the deal go through. Gannett revealed almost no details about the plans for the online operation and refused to say how long it will keep the site in operation. The Citizen employs 60 people, most of whom will lose their jobs, although some may be retained to staff the Web operation. Update 5/16/09: Arizona Attorney General Terry Goddard filed a complaint in U.S. District Court in Tucson late Friday to block the closure of the Citizen. A temporary restraining order is being filed. The move appears to have been initiated by Santa Monica Media Corp., which says it bid a fair price for the paper but Gannett refused to negotiate. As of 10:30 a.m. MST on Saturday, if was still unclear if Saturday’s issue would be the last. This entry was posted on Friday, May 15th, 2009 at 6:14 pm	and is filed under Facebook. You can follow any responses to this entry through the RSS 2.0 feed. Both comments and pings are currently closed. I’d like to see the financial record for the print edition, compare them to estimates of a web edition and see if any kind of a deal could be reached for an RSS podcast printed edition that would preserve the web edition but five days after a private edition is out with access to the RSS controlled by the post office. Wow – the internet version of the newspaper will have no news! How can you have internet based newspaper with no news? Stupid business decision. This hits home for me because it is my home town and I thought I would share. That said, I read this site very regularly, yet this is my first comment. Thanks for pointing out that error. I come from Montréal, Québec, Canada and we had a newspaper older than that, by about a month. The journal “Opinion Publique” was out there in 1870 too. There were various tracts and screeds before but none were daily papers. 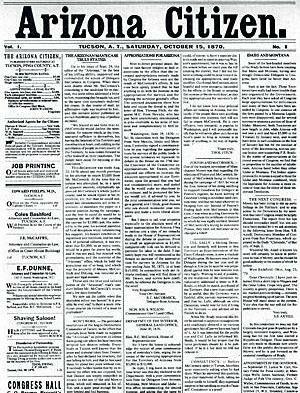 The “America’s oldest newspaper” citation was from the Citizen itself. However, that story has now been taken down and I believe that the designation was in error. I’ll check and correct. Thanks for pointing out the possible mistake. Gannett is scum. They taint everything that they touch. The death of the business is appropriate. You’re right: The Citizen is Arizona’s oldest daily, not America’s. I was going to be a journalist. In college I got distracted and changed majors. I soooo dodged a bullet.